Yesterday I went into the Barnes and Noble at Union Square looking for a certain book. 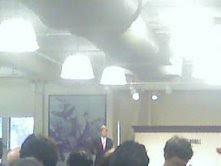 As I'm walking off the escalator onto the 4th Floor, I see somebody giving a talk and I'm like, oh, that's John Kerry. Anyway, I started thinking, what if there was a coffee shop that was like Starbucks, except it was called Kerrybucks, and everyone who works there looks like John Kerry?